Pasadena & South Pasadena Tile, Lowest prices on all Countertops Marble, Quartz, Granite, Cabinets Prefab & Custom! Call or Click Today! Whether you are looking for beauty or durability of natural stone tile or high density porcelain tile flooring, you'll find quality flooring products at wholesale prices to meet every building need and budget. We have top brands and can provide you with a broad range of styles, sizes, and colors, to use in traditional and modern flooring and wall applications. Over 155 positive yelp reviews! Free sink for new customers only! Shaw Carpet, Caeserstone, Silestone, Pental, Qortstone & Samsung Quartz Counter Tops KraftMaid Cabinetry, Custom Back Splash Tile - All on Sale Free Local Estimates! We are your go to source for the best service & prices when it comes to remodeling your kitchen in Pasadena or Los Angeles. The best prices guaranteed for granite, marble, quartz, tiles, carpet & wood floorign!Compare the benefits of our various lines and discover the best product for your new construction or remodeling project. We stay current with upcoming trends and bring in new products for a contemporary look and feel. You may be looking for spa-like slate tile, the classic beauty of travertine tile flooring, the durability of granite countertops, ornate ceramic or glass tile for backsplashes, Caesar Stone Quartz slabs or elegant marble perfect for vanities and countertops. Whatever your requirements, be it for kitchen or bathroom countertops, showers, or flooring, Design Stone Gallery will provide you with the perfect tile solution. All our top-quality stones are available at competitive prices. Established in 2004, Design Stone Gallery is rather new to Pasadena and Los Angeles, but definitely not new to the areas of stone, tile, marble and granite design. 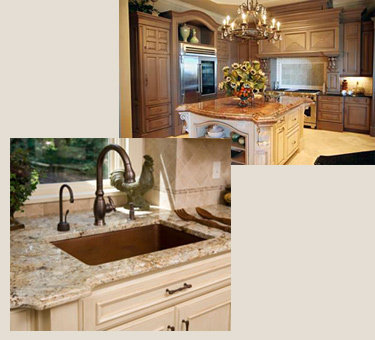 The ownership has actually been in the natural stone and tile business for over ten years, providing quality stone, tile, marble and granite materials for remodeling kitchen and bathroom countertops and flooring among other constructions. Our team of professionals has experience in space planning, conceptual design, color theory, material selection, trend analysis, etc. They have all been carefully selected for design and sales abilities that, rest assured, all your new construction and remodeling needs will be properly accommodated. Design Stone Gallery can help make your visions a reality. We can provide perfect tile solutions for projects in Pasadena and surrounding cities such as Arcadia, San Marino, Glendale and Los Angeles. We have the lowest prices and best deals sales for our cabinets, counter tops, & remodeling services! We are a company and a contractor, offering installation & fabrication services.